Holstein, Missouri; June 1980. From J. W. Fiegenbaum; all rights reserved. 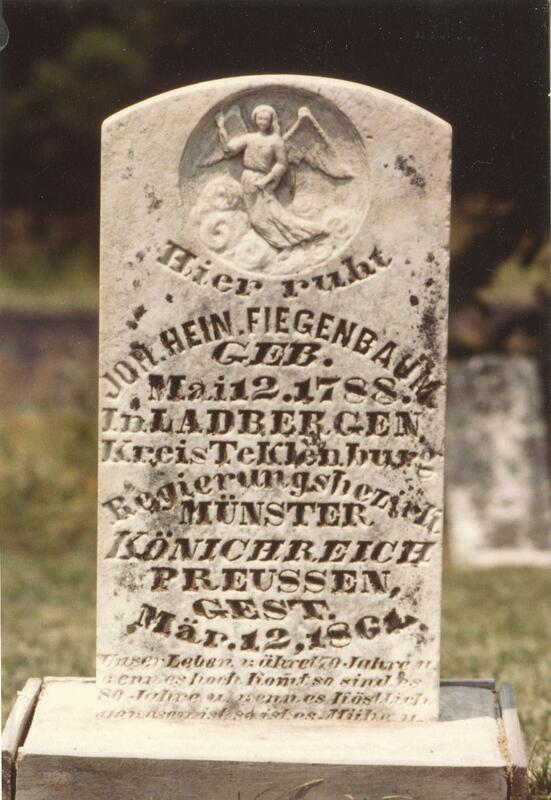 Johann Heinrich Fiegenbaum's grave is in the cemetery across the street from the present day church in Holstein, Warren County, Missouri, USA. Since 1957, the congregation has been known as Immanuels United Church of Christ. 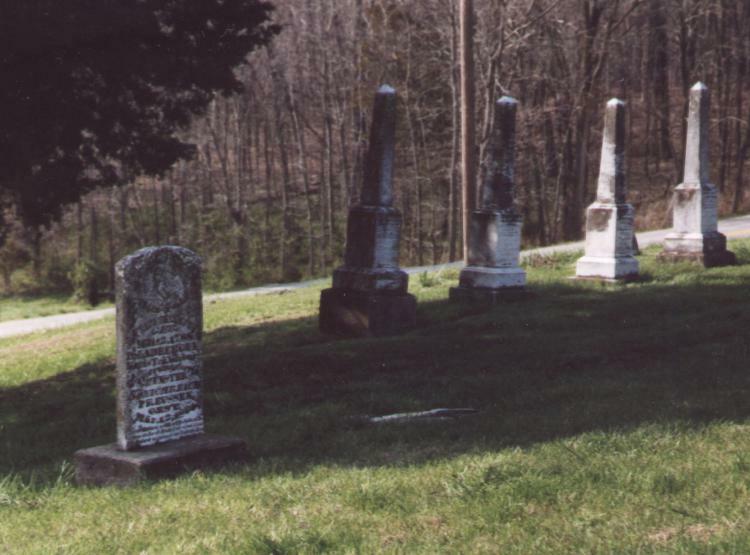 This cemetery is on the former site of the first 2 church buildings erected in Holstein and is the second oldest of the cemeteries connected with the church. The identity of the place of birth is remarkably detailed for a 19th cemetery marker. Yet even this expansiveness only hints at the full story Johann Heinrich Fiegenbaum's life. At the time of his birth, the village of Ladbergen was part of Grafschaft Tecklenburg, a holding since 1707 of the King of Prussia. When he married in his early twenties in 1810, Ladbergen would have been part of the Grand Duchy of Berg, a newly minted entity under the rule of the Emperor Napoleon "in personal union." During the occupation by the First French Empire, official registration of marriage would have been a civil rather than a religious affair. Johann Heinrich and his young family would have experienced the return of Ladbergen to the Kingdom of Prussia following the end of the Napoleonic Era and its inclusion in Kreis Münster, Regierungsbezirk Münster, in the new Provinz Westfalen. Shortly before his younger brother's family immigrated to eastern Missouri, the village would have experienced another change as it become part of Kreis Tecklenburg, Regierungsbezirk Münster. This is the political identity Ladbergen would have had when Johann Heinrich and 12 additional members of his nuclear and extended family also left home for the USA, disembarking from the bark Leontine at Baltimore, Maryland on 28 June 1841 and finishing their voyage in Warren County, Missouri, where Johann Heinrich lived out the last two decades of his 72 years. Holstein, Missouri; April, 2000. From J. M. Fiegenbaum; all rights reserved. Johann Heinrich Fiegenbaum's grave in the cemetery at Holstein, Missouri.